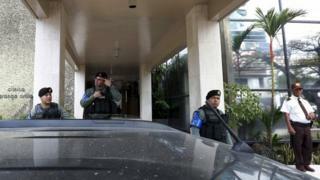 Police in Panama have raided the headquarters of the law firm at the centre of a massive data leak. Prosecutors said the operation had been carried out at the offices of Mossack Fonseca in Panama City "without incident or interference". The leaked "Panama Papers" have shown how some wealthy people use offshore firms to evade tax and avoid sanctions. The firm has denied wrongdoing. It says it is the victim of a hack and that the information is being misrepresented. Panamanian President Juan Carlos Varela has promised to work with other countries to improve transparency in its offshore financial industry. Who's been caught in the scandal? Police carried out Tuesday's raid along with officials from an organised crime unit. Officers set up a perimeter around the headquarters while prosecutors entered the offices to search for documents. Afterwards, the attorney general's office said the aim had been "to obtain documentation linked to the information published in news articles that establish the use of the firm in illicit activities". The statement added that searches would also take place at subsidiaries of the firm. Panama's government promised an investigation soon after news reports emerged more than a week ago based on more than 11 million documents from the firm. The firm tweeted [in Spanish] that it "continues to co-operate with authorities in investigations made at our headquarters". Many other countries are probing possible financial crimes by the rich and powerful in the aftermath of the leak. Mossack Fonseca partner Ramon Fonseca says the company had been hacked by servers based abroad and has filed a complaint with the Panamanian attorney general's office. Mr Fonseca served as a minister in Mr Valera's government but stepped aside earlier this year after separate allegations linked the firm to the corruption scandal engulfing the Brazilian state oil company Petrobras. Panama Papers: Full coverage; follow reaction on Twitter using #PanamaPapers; in the BBC News app, follow the tag "Panama Papers"